Sussex slipped to a second successive Royal London One Day Cup defeat as Essex won at Eastbourne to ensure Jason Gillespie's team ended well out of the running for qualification for the knockout stages. Essex are still in the hunt for a place in the knockout stages of the cup after they chased a target of 282 to beat Sussex by four wickets at The Saffrons. The architect of their victory was Tom Westley who continued his impressive form with his fourth half-century in this season’s competition. He had some luck along the way. Chris Jordan put down a difficult chance at slip when he had scored one and he was also dropped on 68 at long off by David Wiese, also off Danny Briggs. The 29-year-old made the most of those reprieves with 88 from 89 balls including five fours and two sixes, adding 84 with Dan Lawrence to take Essex to within 35 runs of victory. 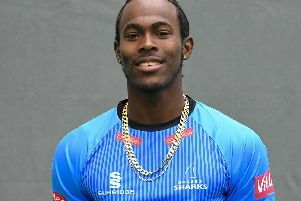 There was a wobble when Westley was unnecessarily run out after being sent back by Lawrence when he was halfway down the pitch and Jofra Archer bowled Lawrence for 36 later in the same over. Ravi Bopara (14) was pinned by David Wiese but by then Essex were only six runs short of their target which they reached with 12 balls to spare. Earlier, Laurie Evans had held Sussex’s innings together with an unbeaten 107 – his second List A hundred. The Sharks were in trouble on 46 for 3 in the 11th over when he joined Harry Finch to put on 113 in 22.5 overs. Against generally accurate Essex bowling it was never easy for the pair to accelerate on a slow wicket and they were forced to rebuild again when three wickets fell for six runs, including Finch for 56 who was stumped by Wheater off a wide, the first of two wickets in successive balls for Zaidi who then deceived Michael Burgess with an arm ball. Sussex were 174 for 6 with ten overs to go, but Evans found excellent support from Jordan and Archer as 107 were plundered off the last ten overs. Jordan made 35 at a run a ball before Archer hit out spectacularly with 33 from 15 balls including three sixes and two fours to the delight of a crowd of more than 4,000. Evans reached his century in the final over when he belted Sam Cole to the mid-off boundary for his eighth four. He also hit two sixes and faced 117 balls. Wheater and Varun Chopra gave Essex’s reply a good foundation with 86 in 14 overs before Jordan pinned Chopra for 33. Wheater looked in good touch, hitting eight boundaries in his 60 off 62 balls and it was a surprise when he missed a reverse sweep at Briggs. Archer had Zaidi (5) caught behind in the 38th over but Essex were well ahead of the required rate by then and on their way to an important victory.